First, let's do one more beta release. There are no gameplay changes since Beta 2, but I did massage the audio a bit. Basically, I applied some modulation to the 60 Hz noise in the audio output. This seems to soften the effect of the noise, making it a bit more reasonable for those with sensitive ears. Don't worry -- the audiophiles will still hate it! I've gotten a few suggestions for changes/improvements to Fahrfall, some better than others. There are a few minor ones that I might implement someday, including some (e.g. a graceful program exit) that are more suitable for disk-based play. But for now, I'm only concerned about releasing Fahrfall on cartridge. I do have a few more ideas for game improvements on my TODO list, most or all of which have been there since the beginning (e.g. collecting bonus items). I reserve the right to add a few of those before doing a final cartridge release. I have been hinting rather strongly at a cartridge release for Fahrfall, and I do intend to make that happen. This entire Summer Challenge has been laying the groundwork to make that seem practical, and I think I've shown what I can deliver to folks. I have even started getting monetary offers for cartridges! I wish I was ready to announce something, but I haven't quite ironed-out all of the details of that. I hope to announce something before too long -- keep an eye out! Ingredients for an adult-sized CoCo joystick? Beyond that, it is hard to tell what comes next. I actually thought I would be working on another C compiler project this summer, but Fahrfall got my attention instead. 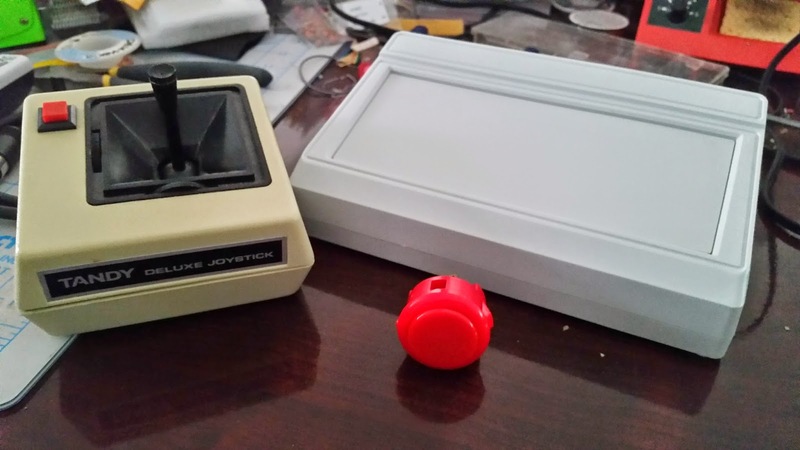 Now I'm already thinking about another CoCo game controller project, but that will probably be covered over at my Retro Tinker blog. I've been thinking about another VDG trick that could use some development time as well. So much to do, so little time! So now I will sign out of the Retrochallenge 2014 Summer Challenge and we will return back to the everyday progress of Fahrfall. It is not Game Over yet, so please continue to stay tuned!